Today's article serves as a general guide to keeping Windows 7 and Vista clean. The goal is to clean up your messy computer and have it running at maximum performance in no time. The question at hand is—what is your computer's performance like? Not great? Do you think it could be as a result of not taking good care of your computer? If so, then this article is for you! The very first step is to remove unnecessary items from the computer, such as items that came pre-installed when you brought it. These can include (but not limited to) trial games and antivirus programs. The general rule is: Any program that comes as a trial or something you must pay to use—remove it! Toolbars are everywhere. These can be sneaky little buggers. Most toolbars come from installation packs. Toolbars, when installed, can quite often be hard to remove from the system, so keep a careful eye on your installation packs. NEVER choose the recommended installation method. It is advised to always choose the advanced option, as this is where you'll find most toolbars hiding. CNET's Download.com, a reputable organisation, has many great downloads. But let's study this a bit more. Why do programs come packed with toolbars, and sometimes other software? The answer is pretty obvious—it's called advertising. Small companies will often go to large sites that receive lots of downloads and ask to advertise their products in the downloads. So in this case, Blekko would have gone to CNET and offered a sum of money to advertise. In return, Blekko gets more publicity and buys more customers. Notice how the following are checked by default in the above picture? This is because many people, including me a few years back, click next, next, next without reading. Is this you? Then stop. 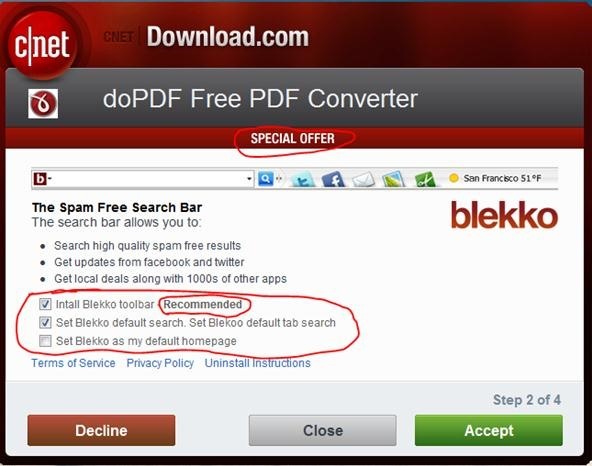 Because you could be greeted with toolbars that are difficult to remove, malware, or even open your home page the next morning to see Blekko's home page. So, slow down and read. Now, another interesting thing in the above photograph is that the marketers also thought about those who DO stop and read. So, in a last attempt to buy customers, they added "special offer" in capitals to ensure it stands out. Further, the "recommended" was in bold. Don't be so quick to believe that "recommended" necessarily means a great product, so think twice before clicking next. In my personal opinion, toolbars are pointless. They slow down the computer and the browser. They honestly cause more problems then they fix. The next step is to install CCleaner and CCEnhancer. CCleaner which is formally known as CrapCleaner is probably the best cleaning tool out there. CCEnhancer isn't associated with the CCleaner development team in any way or form, however this tool adds an additional 500 programs to CCleaner for it to clean. The most common question I get is: What should be checked? This is a highly configurable program, so there is no direct answer for this question. I have personally checked everything but "wipe free space", as that doesn't need to be done often (and this can take hours to complete when checked). I have also not bothered with "Windows Backup*", as I need my computer back-ups. Let's take a look at what alternative programs are out there to replace all those resource hogs. Microsoft Word: The best free alternative is Google Docs. Adobe Reader: The best free alternative is Foxit Reader. Internet Explorer: The best free alternative is Firefox (IMHO). Competitors: Opera, Google Chrome, Comodo Dragon, SeaMonkey & Waterfox. Adobe Photoshop: The best free alternative is RawTherapee. Windows Live Messenger: The best free alternative is Skype. Windows Media Player: The best free alternative is VLC Media Player. Remember, a hard drive that is close to full (or is in the red zone, as shown in the picture at the top of this article) means you need to reduce clutter on your hard-drive or buy an external (or a second internal) hard-drive. I recommend an SSD over HDD. Task #1: Change the default size of recycle bin. 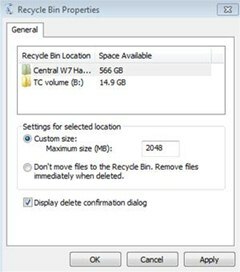 Reducing the size adds extra space to your computer, but it will also mean bigger files cannot fit into the recycle bin (should the files exceed that limit). I recommend changing the maximum size for (C:) Drive to 2048MB. Task #2: Disable Hibernate, as this can use a significant portion of space. To disable Hibernate, navigate to Windows -> search -> "CMD" and click "Run as Administrator". In the command prompt type "powercfg -h off" -> enter and then you're done. To enable again, enter "powercfg -h on" in the Command Prompt. Task #3: Vista and W7 Compression. (Note: this is not the same as a zip file—also note that you might notice a slowing in performance when you open a compressed folder). Do you download a lot? Maybe you're a photographer and have thousands of photographs on the computer. How can you compress them so they aren't using up so much space? It is as simple as right clicking a folder with contents in it or a file -> click advanced, and then "compress contents to save disk space". To decompress the contents, just deselect it. I could explain so many more ways to free up space and speed the computer up, but honestly, that would be one very long post! To find out more ways do a Google Search, or check out some great articles on WonderHowTo. Check out WinDirStat—it analyzes the computer and tells you what is taking up all your computer's space. Thanks, Rachel. I do my best to make good articles that will benefit everyone at WonderHowTo. I mean we have beginners, intermediate and advanced computer users here and that is why I like to do blog posts for all technical levels.